Outline: The story of Jonah. Mark 16:16. John 3:16.For children. Scripts are basic guidelines for translation and recording into other languages. They should be adapted as necessary to make them understandable and relevant for each different culture and language. Some terms and concepts used may need more explanation or even be replaced or omitted completely. One day God said to Jonah: "Go to the big city of Nineveh and thunder in their ears that I am seeing all their wickedness." Well, Jonah didn't want to be a missionary to those people, so he began to run away. He got on a big ship and started out to sea. (Pause 5 sec. for harbor sounds) I guess he thought he was safe then, and since he was very sleepy, he curled up in a corner and went to sleep. Do you think Jonah could run away from God? Listen and see if he did. (Pause 3 sec. - wind) Suddenly a furious wind began to blow and it shook the ship. Soon there was a heavy storm. The waves got so high that they splashed into the ship, and the sailors began to get scared. They prayed to their idols. Of course their idols couldn't stop the storm. It just got worse. "Whose fault is this?" they thought. "Where's that fellow Jonah?" (Call "Jonah" with head turned away from mike.) They found him asleep and cried out, "Get up, you sleepy head, and call upon your God so that we won't perish!" Then they asked him, "Who are you? Where are you from?" Jonah told them everything - that he worshipped the true God but had run away from Him. He said, "It is all my fault; throw me overboard and the sea will be calm again." They didn't want to do that. But the storm just got worse and the waves higher and higher. So at last they picked up Jonah - 1, 2, 3, - Go! And splash, into the sea he went. (Pause 3 sec.) - Silence) And sure enough, the storm stopped. Then, guess what! A big fish just opened wide its mouth and down went Jonah! Swallowed whole! It was black dark and I suppose it didn't smell very good. Then Jonah began to pray to God and said, "I will give thanks unto your name and will do what I have promised to do. I know that you are the only One Who can save." 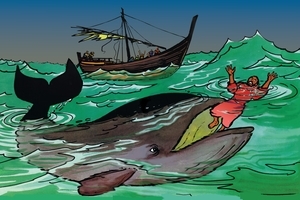 When God saw that Jonah was truly sorry He made the big fish go to the shore and it then threw up Jonah on the land. Well, you can be sure Jonah obeyed God this time. He headed for Nineveh as fast as he could go and began to preach about God and judgment to come. Do you know what happened? Hundreds and hundreds of people, big people and children, too, began to pray and were saved - just because one man obeyed God. Now if you are God's child, He speaks to you just as surely as He did to Jonah. He says, "You go into all the world and preach the Gospel to every creature." 'Gospel' means "The Good News" that Jesus Christ can save us from sin. Because God so loved the world that He gave us His only begotten Son, that whoever believes in Him should not perish, but have everlasting life. GRN has recorded a version of this script in 87 languages and dialects. See full list. See different versions of this script in Portuguese, Spanish. If you have any comments or suggestions about this script, Contact the GRN Language Hotline.